It may have been another fruitless season for the first-team as far as trophies were concerned, but two of the club’s young professionals concluded their respective campaigns today by picking up winners medals. 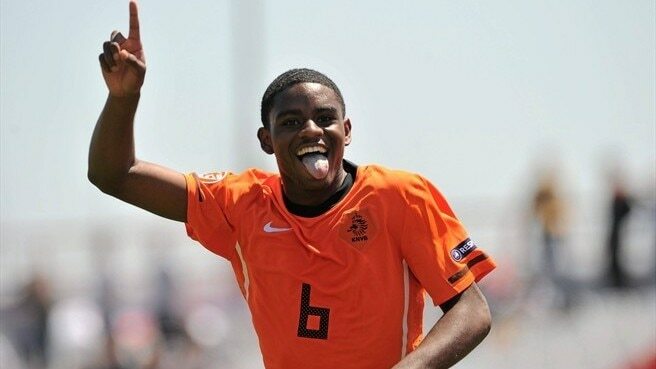 Kyle Ebecilio ended an impressive first season in North London by finding the net as his Netherlands side beat Germany 5-2 to win the UEFA U-17 European Championships for the first time. Ebecilio, who also scored the only goal in the Semi-final victory over England, scored in the 77th minute against the Germans to complete an impressive win. Meanhwile, in Scotland, Kyle Bartley was present to pick up his medal as Rangers celebrated securing the Scottish league title. Despite seeing his time at Ibrox curtailed through injury, Bartley played a sufficient number of games during his spell to earn a medal. He will now return to Arsenal as he looks to recuperate in time for the new campaign. At least one gooner got a medal. He should hold on to it tight, he may never get one again. Pehaps Kyle can show off his medal to most of the losers we have at the club and show them what a winners medal looks like. Hopefully he will given a chance next season in the Carling Cup along with Lansbury, Eastmond, JET and Gibbs and get rid of Bendtner, Eboue, Squillaci, Denilson and Almunia. Glad for Bartley, thought he wouldn’t get a medal. Definitely glad Rangers won it now, lol. it’s crazy bartley got a medal…he only played a handful of games…hopefully he won’t let it get to his head too much…playing 6 or 7 games for a team that wins the league doesn’t make you a champion. actually wenger shouldn’t have allowed him to accept it.